Some say the most beautiful woman ever -- and an undisputed real-life princess. 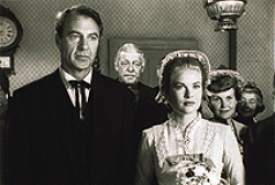 About to marry Gary Cooper in HIGH NOON (1952). 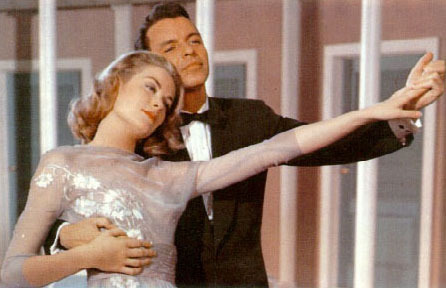 Kelly's role in this film was not very big, but she made enough of an impression on Alfred Hitchcock to earn a position as one of his cool blonde femme fatales in three of his films later that decade. "I love funny exit lines." --as Lisa Fremont in REAR WINDOW. "Surprise is the first element of attack." --as Lisa Fremont in REAR WINDOW. "Are you sure you were talking about water skis? From where I sat it looked as if you were conjugating some irregular verbs." 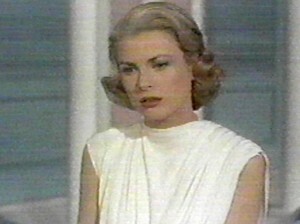 --as Frances Stevens in TO CATCH A THIEF (1955). "The time to make up your mind about people is never." --as Tracy Lord in HIGH SOCIETY (1956). "Isn't it time for your milk and arsenic, darling?" --as Tracy Lord in HIGH SOCIETY (1956). "I couldn't possibly break down, Mr. Connor. I was born on a pedestal." --as Tracy Lord in HIGH SOCIETY (1956). 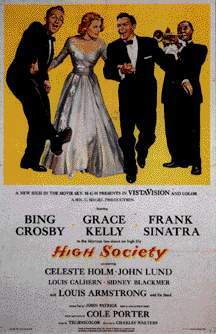 A poster from HIGH SOCIETY (1956) with Bing Crosby, Frank Sinatra, Celeste Holm and Louis Armstrong, a musical remake of THE PHILADELPHIA STORY (1940). This film doesn't have the humor of the original, and Crosby seems a little old for the part of C.K. Dexter Haven, but the music is nice--especially Armstrong's jazz contributions and songs like "Who Wants to be a Millionaire?" and "Well, Did You Evah." Incidentally, Kelly had just become engaged to Prince Ranier of Monaco before making this picture, and the huge ice-skating rink-of-a-diamond ring she wears in the picture is her real engagement ring. Dancing a rhumba with Frank Sinatra to "Mind If I Make Love to You?" in HIGH SOCIETY. "I keep thinking I hear bells." --Tracy. As Tracy Lord deep in thought after her father accuses her of being made of bronze. "That's an awful thing to say to anyone." --Tracy.